Do you want to create personalized or automatic responses to your friend? If so, this guide will help you to do it. Reply-to Email: You can use a different email on this section. This email will be used to receive when someone respond to the form message. Recipient E-mail: Located at the lower right part of the Sender & Recipient details. You should select the "Friend Email" field from your form. 6. Under the "Email" tab you can edit the Subject and Body of the email to be sent. At the end of the editing tools, there is a menu named Form Fields. 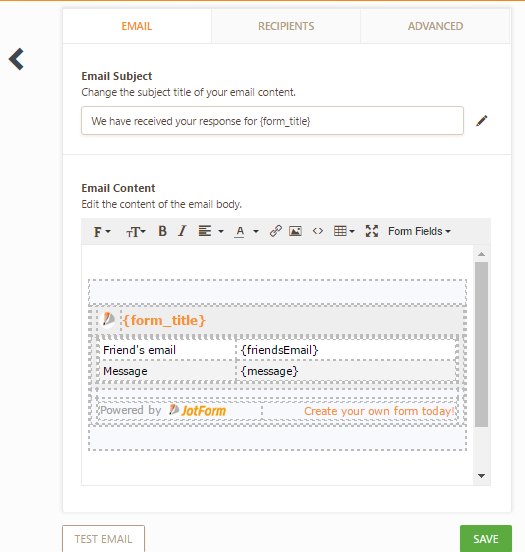 The Form Fields are the fields connected to the form you're creating. 8. Click "Save" button to save your auto responder email. Questions? Please let us know below! Is there any way I can accept multiple emails, separated by the comma from the user? I'd like user can choose where the form sending to by selecting between 2 or 3 submit buttons. 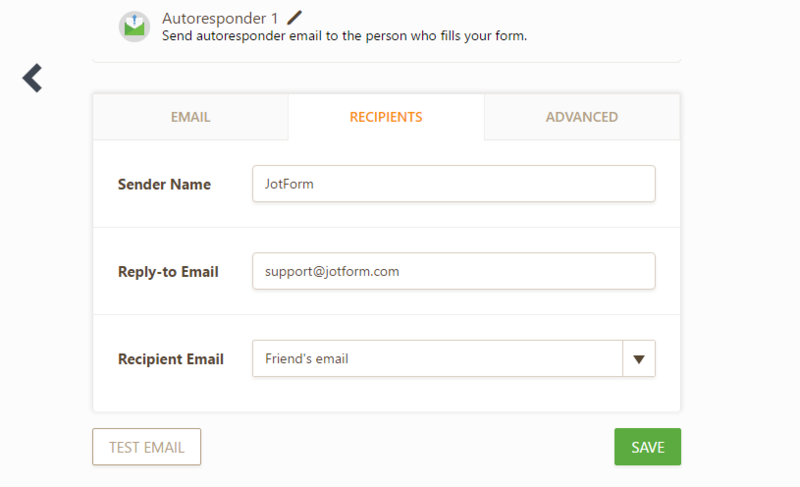 I want to put 3 submit button on the form and assign different emails to each button. How can I dot it ? Having trouble viewing auto email on a mobile phone due to size of screen. Any way to change the setting to be mobile friendly? What if I want to be able to send to more than one friend at a time? I guess I made amistake with my tell a friend form, becuse the given friends did't recive any email when I test it. What could be the problem? Looks like using this approach I'd have to create a "tell a friend" form for each event or promotion. Is there any "tell a friend" forms that are smart enough to pull in (or ask you to enter) the URL that you'd like to pass along?